BBC NEWS | Europe | Why search for a new nuclear treaty? Why search for a new nuclear treaty? US and Russian officials have been holding talks in Rome as they begin work on a new nuclear weapons treaty. BBC diplomatic correspondent Jonathan Marcus looks at why they might want one. In some ways it is like a reprise of the Cold War: US and Russian officials meeting in a European capital to discuss the arcane and complex details of a new arms control treaty. The goal is to have the new agreement ready by the end of 2009 when the first Strategic Arms Reduction Treaty (Start), that dates from 1991, expires. Start negotiations began at the height of the Cold War and the treaty was eventually signed just months before the Soviet Union's collapse. It was, for its time, a remarkable document, cutting back the superpowers' huge nuclear arsenals to fewer than 6,000 nuclear warheads apiece, deployable on some 1,600 strategic delivery vehicles. Start was a product of its times and attempted to curtail and codify the balance of nuclear weapons with complex and detailed counting rules and verification provisions to ensure that it was upheld. The most recent US-Russian arms control treaty, which is known as Sort (Strategic Offensive Reductions Treaty) and was signed in 2002, is an altogether different document. It is brief, simple and contains next to no verification provisions. It hails from a time when Washington in particular saw little future for complex arms control treaties. Why were they needed, went the argument, if the US and Russia were no longer involved in the Cold War? But the context today is very different. And the very short deadline - the hope is an agreement by the end of 2009 when the existing Start treaty expires - is indicative of this very different climate. Both Washington and Moscow want a new treaty, but they want it for rather different reasons. For the Russians it is a kind of search for lost status: arms control talks are, after all, what the two superpowers used to get up to. Russia is no longer a superpower. But it sees itself as an important player and the renewal of strategic arms talks with the Americans underlines this fact. A smaller arsenal will also help Russia save money, and a treaty with the full panoply of verification and transparency measures will give Moscow predictability in a field that it still regards as crucial to its security. For the Americans a new arms control treaty is a means to an end. For one thing it may be one of the keys to a better relationship with Russia. And this is important to Washington since Moscow's help is needed for a variety of other issues - curbing Iran's nuclear ambitions and access for supplies into Afghanistan to name just two. President Barack Obama has backed the lofty goal of abolishing nuclear weapons one day - all part of an effort to bolster the broader non-proliferation regime that many see as dangerously weak. Fewer US and Russian nuclear weapons will help with this goal too. Of course, huge political and practical questions remain. 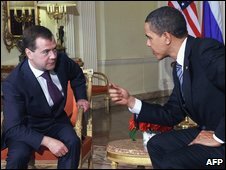 How smoothly will these new US-Russian negotiations proceed? Could they, for example, be thrown off course by Moscow's unhappiness with US missile defence plans, or will Washington give ground here? Even with the best will in the world, arms control is a difficult and complex issue. The existing Sort agreement allows each side some 2,200 nuclear warheads. Both the US and Russia probably have around this number deployed, but retain many more in reserve. One of the most intriguing questions is just how much lower will Washington and Moscow want to go? And if they do move significantly then the pressure will grow for other nuclear weapons states to begin to think about including their arms in a future negotiating process.